The Whitechapel Gallery is being turned into a luxury hotel. Sorry about that. 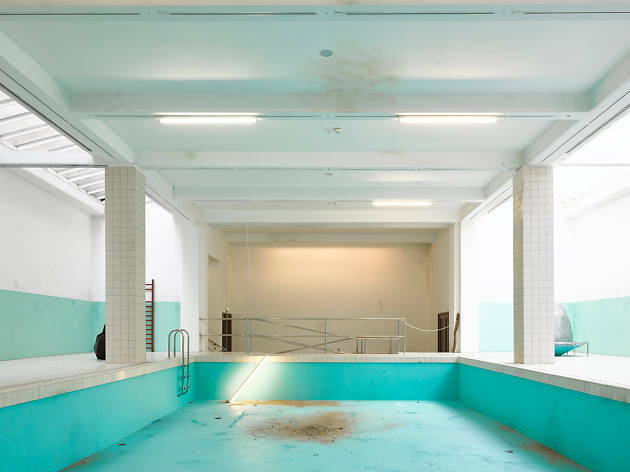 Its galleries will be turned into suites for the moneyed hipster elite to huff designer drugs in, and its pool will become an opulent spa. 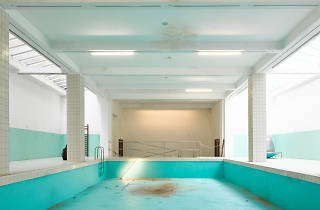 You probably didn’t know the Whitechapel had a pool, but it does. Been there since 1901, in the main gallery, hugely popular in the 1970s. Hockney painted it back in the day, apparently. Or that’s what Scandi art duo Michael Elmgreen and Ingar Dragset want you to believe. The mischievous bastards have built a full-size pool right as you walk into the gallery. It’s empty and decrepit, littered with debris and leaves, its tiles cracked and dusty. It’s lived through its fictional heyday, and now, like everything else in this city, it has been earmarked for redevelopment. You’ll still be able to swim here when it’s a hotel, sure, as long as you’re a guest or a member. It’s not subtle. It’s a jackhammer of a concept, bashing your skull in with its blunt-force indictment of gentrification and the constant loss of a city’s public, special spaces. What it lacks in subtlety it more than makes up for in brutal effectiveness. And that goes for all of Elmgreen & Dragset’s shtick. Upstairs, canvases show the names and dimensions of well-known artworks, but not the art itself. A baby in a basket has been dumped in front of a cash machine, a small child stares at a framed rifle, a maid watches over a kid huddling in a fireplace. The first two galleries of this show are brilliant, the final one – with all of its white sculptures – is a bit of a letdown, but it all works to some degree. Every piece is an ultra-direct visual gag. Set-up, punchline, bang. There are doors that can’t open, urinals plumbed into only one another, car seats made of bronze. The duo has its targets – gentrification, masculinity, capitalism, power structures – and they’re not cryptic about it. You feel like they’re taking the piss, but like the joke’s never on you. Unless you’re the kind of person who wants to be a member at an east London luxury pool. Then it is on you. Soz.